Australian public broadband initiative NBN has announced it will be incorporating G.fast into its technology mix from next year. This marks a significant endorsement of the much-maligned technology by a major infrastructure player and has been one of the talking points of Broadband World Forum 2017. There’s nothing intrinsically wrong with G.fast, of course, but it has generally been viewed as a compromise move rather than going all-in on fibre-to-the-home. 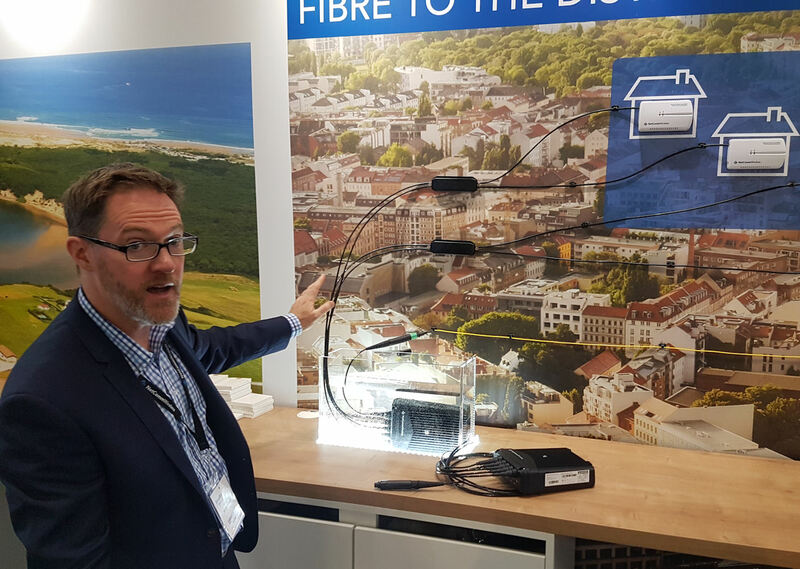 “Bringing G.fast technology to the NBN access network in 2018 again shows our commitment to being at the cutting edge of emerging technologies,” said JB Rousselot, Chief Strategy Officer of NBN (pictured at BBWF 2017 above). “Adding G.fast to the toolkit for the FTTC and FTTB networks will allow us to deliver ultra-fast services faster and more cost effectively than if we had to deliver them on a full Fibre-to-the-Premises connection. As we wrote previously the industry seems to have got the memo that banging on about FTTH the whole time isn’t very constructive. It remains the ideal fixed line technology but it just isn’t practical or economically viable in many cases – especially more remote locations. So the sensible approach is to be open to a mix of technologies and use the most appropriate one for the location. NBN is a few years ahead of most infrastructure players in adopting that kind of pragmatic approach, according to Netcomm Wireless CTO Steve Collins, who we met at the show (pictured below) and whose company is one of NBN’s technology partners for this G.fast initiative. NBN is a public initiative and launched at the start of the decade with all sorts of lofty FTTH ambitions, but has since had to introduce other technologies as the sheer enormity of the task hit home. The other tech partners for this gig (excuse the pun) are Nokia and Adtran, who also have a conspicuous presence at the show. Nokia’s stand, in fact, seems to have been over-run the entire time and while Huawei is also here in force, Ericsson is conspicuous by its absence, but then again fixed-line isn’t really its thing. We also caught up with Federico Guillén, President of Fixed Networks at Nokia. He has been stressing the mixed technology message at the event and said NBN’s approach is a great illustration of his point. He has been talking about ‘fibre to the most economical point’ for a while and you get a sense that he feels that’s finally paying off. The NBN news has contributed to a general sense at this year’s show that we’ve moved on from stigmatising G.fast as a compromise technology. Yes, it allows infrastructure companies to further sweat their copper assets, but if end users are getting a good level of broadband performance – most importantly a guaranteed acceptable minimum – then what’s the problem? You can read further analysis of the NBN announcement at UBB2020.